Another snowstorm hits the Midwest today. As much as I hate driving in the snow, I couldn't resist taking pictures of the freshly falling snow today. It’s just so beautiful and magical. This J.Crew double-cloth slim trench has to be my absolute favorite purchase this year. It's blistering cold out but this jacket keeps me toasty. Although it may seem like I am not dressed properly for cold weather. I was going to do a review on this jacket but got lazy. It's still on major sale right now. Although, small sizes might not be available anymore. The fit of this jacket is pretty much the same throughout compare to the J.Crew double-cloth lady day (wore here). The body length is the only major difference between the 2 jackets. The slim trench is about 2 inches shorter than the lady day (which is a plus for a shorty like myself). If you need more details about these J.Crew jackets, check out Elle’s thorough review. I am wearing my new tee from Forever 21 here. I haven’t purchased anything from them for the longest time but am happy with the quality of this specific piece. I don't find the knit fabric flimsy at all. The long sleeve stripe top is a classic piece that can be worn in so many different ways. Peplum is a great way to add a fun twist to any outfit. Happy Friday, everyone! Hope you all enjoy your weekend! Love the photos in the snow. Look so magical. The coat and peplum top look so great on you! LOVE the coat! I see that you went with 00R. Did petites not fit well? I always wonder about the petite sizing versus regular. Love the peplum on you! @bella Yes, I went with the 00R (as expected). I could fit in a 00P as well but the sleeves would have been far too short on me. Such pretty pictures! I love the peplum top. You look gorgeous. Ohmygosh, you're so brave Sydney. The pictures turned out beautifully! So worth a few minutes in the cold :) What's your secret to keeping your camera dry? @Cee Hi Cee! The camera was actually underneath a covered porch. I love the fact that you are dressing appropriately for the weather. I see many blog OOTDs of people who act like it's not cold out there. Please keep these type of posts coming :). I really look forward to see how people dress when it's not always warm and sunny. Lovely outfit! Glad to see your F21 top, that fits you perfectly! I love the photos!!! So pretty with the snow. :) Cute outfit too with the peplum top! Snow made a beautiful back drop here. You look so cool standing out in all white. I need to mix stripes with leopards too. Obviously, they made an excellent combo. I'm so glad I found your blog, you have pieces that are very affordable and just style them really well. 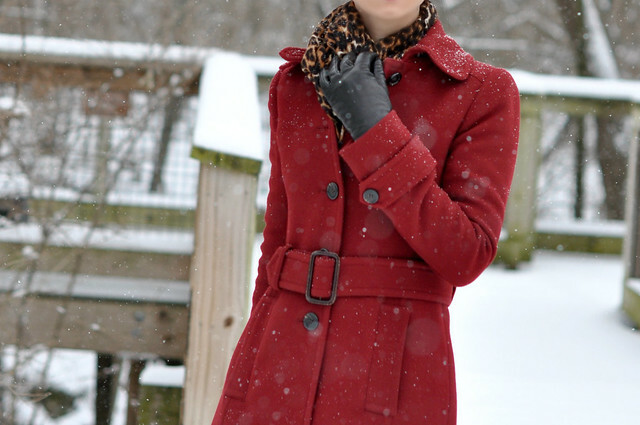 Beautiful pictures, Sydney, and i love the striped peplum top and the Burgundy coat! The stripes and animal print go nicely together. And your winter photos are gorgeous. All of your snow looks so pretty! We got a dusting last night, I was hoping for a bit more. I love the striped peplum on you, and your coat is gorgeous! Your outfit is perfection! And the photo in the snow is beautiful! you look so lovely - and the coat is a gorgeous colour on you! have a great weekend Sydney! As for settings for indoor, I just purchased a new external flash which is awesome for indoor photography! 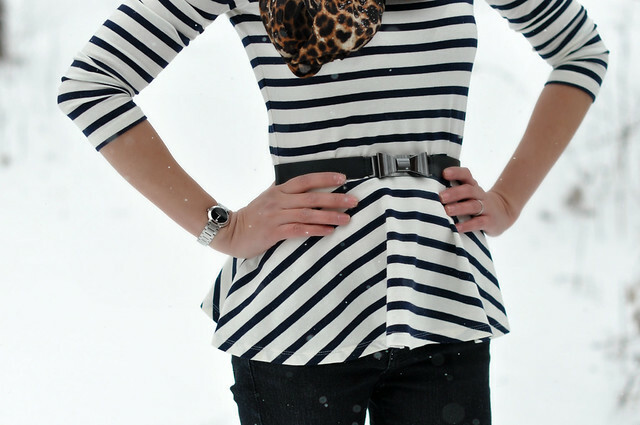 Super cute shirt and I love the bow on your belt! Beautiful pictures! Love the red amongst the black and white.